Planck has discovered a bridge of hot gas that connects galaxy clusters Abell 399 (lower centre) and Abell 401 (top left). Planck has discovered a bridge of hot gas that connects galaxy clusters Abell 399 (lower centre) and Abell 401 (top left) as seen in this space wallpaper. The galaxy pair is located about a billion light-years from Earth, and the gas bridge extends approximately 10 million light-years between them. 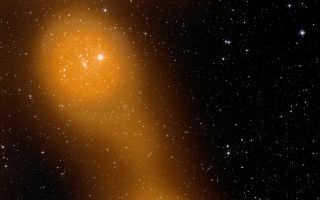 The image shows the two galaxy clusters as seen at optical wavelengths with ground-based telescopes and through the Sunyaev-Zel'dovich effect (in orange) with ESA's Planck satellite.